274 pages | 44 Color Illus. | 5 B/W Illus. Mankind now faces even more challenging environment- and health-related problems than ever before. Readily available transportation systems facilitate the swift spread of diseases as large populations migrate from one part of the world to another. Studies on the spread of the communicable diseases are very important. 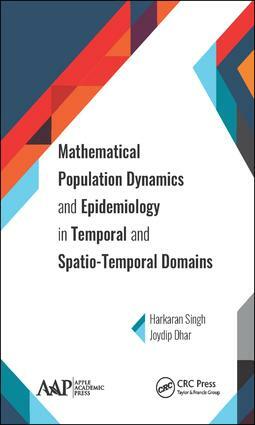 This book, Mathematical Population Dynamics and Epidemiology in Temporal and Spatio-Temporal Domains, provides a useful experimental tool for making practical predictions, building and testing theories, answering specific questions, determining sensitivities of the parameters, forming control strategies, and much more. This volume focuses on the study of population dynamics with special emphasis on the migration of populations and the spreading of epidemics among human and animal populations. It also provides the background needed to interpret, construct, and analyze a wide variety of mathematical models. Most of the techniques presented in the book can be readily applied to model other phenomena, in biology as well as in other disciplines. Introduction and Mathematical Preliminaries. Discrete-Time Bifurcation Behavior of a Prey-Predator System with a Generalized Predator. A Single Species Harvesting Model with Diffusion in a Two-Patch Habitat. A Single Species Model with a Supplementary Forest Resource in a Two-Patch Habitat. A Two-Competing Species Model with Diffusion in a Homogeneous and Two-Patch Forest Habitats. A Competing Species Model with Diffusion in a Two-Patch Habitat with a Common Supplementary Resource. Dynamics of a Prey and a Generalized-Predator System with Disease in Prey and Gestation Delay for Predator in Single Patch Habitat. An Epidemic Model of Childhood Disease Dynamics with Maturation Delay and Latent Period of Infection. Bifurcation in Disease Dynamics with Latent Period of Infection and Media Awareness. Continuous and Discrete Dynamics of SIRS Epidemic Model with Media Awareness. Dynamics of SEIRVS Epidemic Model with Temporary Disease-Induced Immunity and Media Awareness. Harkaran Singh, PhD, is an Associate Professor at Khalsa College of Engineering and Technology, Amritsar, India. He has many years of experience in teaching and research. He received an award for “Young Investigator from India and Southeast Asia” from the International Society of Infectious Diseases at the 17th International Congress on Infectious Diseases held at Hyderabad, India. He has published several research papers in peer-reviewed journals. He obtained his PhD degree in Mathematical Modeling in Population Biology from IKG-Punjab Technical University, Kapurthala, India. Joydip Dhar, PhD, is an Associate Professor at the ABV-Indian Institute of Information Technology and Management, Gwalior, India. He has been involved with teaching and research for the past 21 years and has also published about 125 papers in international journals. He has guided PhD students as well as MTech and MBA theses. Dr. Dhar has delivered more than 50 invited lectures at different universities and institutions in India and abroad, including the UK and Sweden. He has co-authored a research book and has conducted several conferences and short-term courses. A life member of many professional societies (ISTE, IMS, ISMMACS) and an annual member of the American Mathematical Society (AMS), Dr. Dhar has participated in the prestigious ACM-ICPC world finals as a mentor at Stockholm, Sweden 2009. He was the recipient of a Dewang Mehta National Education Award, among other awards. Recently he attended a prestigious 8-day in-residence program for Inspired Teachers at Rashtrapati Bhavan, which is the highest recognition for any central government institution teacher.